In his first media conference as President-elect, Donald Trump, without naming any country in particular, laid bare his views on the U.S. pharmaceutical sector, as well as on the loss of American jobs in manufacturing, both of which are issues with potential to hit Indian business interests. 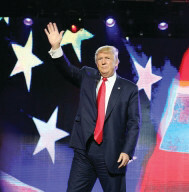 Nine days before he is to be sworn as the 45th president, Trump spoke of his plans to stem the flow of manufacturing from America and took aim at the pharmaceutical sector. “We’ve got to get our drug industry back,” he said. “Our drug industry has been disastrous. They’re leaving left and right. They supply our drugs, but they don’t make them here, to a large extent,” he said at the chaotic news conference on Wednesday in the lobby of Trump Tower in Manhattan, attended by some 250 journalists from the world over. The U.S. is the largest market for Indian drug makers. In 2015, India exported $6 billion worth of drugs to the U.S. and could feel the impact of the Trump announcement to change drug pricing policy. Trump’s strong remarks on “overcharging” by pharma companies indicates a future tougher operating environment for foreign companies, including Indian, in the U.S. However, India could also gain from his plans to cut the cost of pharmaceuticals because of its leadership in generics. He promised to start such “bidding” and save billions of dollars for the U.S. over a period of time. Just hours after the press conference, Indian pharma companies were trading in red. The S&P BSE healthcare index receded by 110.99 points. Shares of Sun Pharmaceutical, Dr. Reddy’s, Lupin, Cipla, Cadila and Glenmark were down on the BSE. The scrip price of Cadila went down by 1.89 per cent to close at Rs 350.45 per share. Lupin was down 2.03 per cent at Rs 1,489.45 and Dr. Reddy’s 1.19 per cent at Rs 3,011.20. Sun closed at Rs 643.90 down 0.59 per cent. Wockhardt lost 11.30 points and closed at Rs 687.45, down 1.62 per cent. Glenmark closed at Rs 889.95 per share, down 1.57 per cent. IPCA Labs closed at Rs 548.85, losing down 7.50 points. NATCO at the closing traded at Rs 640.40 down 0.09 per cent. He also threatened to impose a “border tax” on companies that move manufacturing outside. Trump spoke about Fiat Chrysler and Ford setting up factories in the Midwest where the core of his supporters scarred by de-industrialization live, with more such plants to be announced in the coming weeks. They were all because of his efforts, he declared. A mega Indo-U.S. defense venture could take a potential hit following Trump’s announcement. According to U.S. media reports, both Lockheed-Martin and Boeing have been in talks with the Indian government to set up production facilities in India for building latest design fighter jets. Lockheed-Martin is reportedly planning to move the entire F-16 assembly line to India, making it the sole producer of the iconic fighter airplane. The Lockheed production agreement alone is estimated to create 1,000 jobs in India.